...found guilty of second-degree murder. Spector exhibited no reaction to the verdict. His lawyer argued that he should remain free on bail pending the May 29 sentencing but Judge Larry Paul Fidler remanded him to jail immediately. Second-degree murder carries a penalty of 15 years to life in prison. Spector's young wife, Rachelle, sobbed as the decision was announced. Is he too old to be anally raped? Barabajagal wrote: Is he too old to be anally raped? Come on now. Nobody is too old for THAT! Following yesterday's conviction of Phil Spector on second-degree murder in the death of actor Lana Clarkson, agent Sharlene Martin of Martin Literary Management reports she is shopping a proposal for a "tell-all memoir from adopted son Louis Spector," THE GINGERBREAD HOUSE ON LA COLLINA DRIVE: My Life Caged Behind Phil Spector's Wall of Sound. Louis and his twin brother "were adopted at the age of five by Spector and presented to Spector's then unsuspecting wife as a surprise Christmas gift." Talk about an overwrought title. Sheesh! 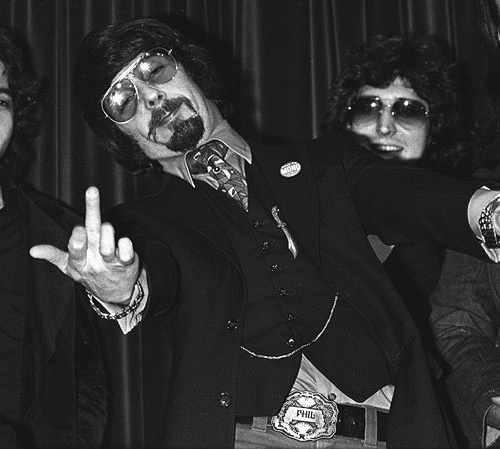 I've posted this before, but Tearing Down the Wall of Sound is a thoroughly engrossing look at Phil Spector and the music industry. Well worth a trip to your local library. D. Phillips wrote: Talk about an overwrought title. Sheesh! Yeah, but I'd LOVE to work on it! Um..maybe after the author's father is locked away for a goooood loooong time.